Integration Services service is not a clustered or cluster-aware service and does not support failover from one cluster node to another. Therefore, in a clustered environment, Integration Services should be installed and started as a stand-alone service on each node in the cluster. 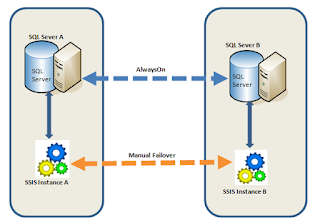 oSSIS B instance will refresh the SQL Server B.
oSSIS A instance will refresh the SQL Server A. •Process will be start from starting Point. •Package will be restarted from the point of failure by using Checkpoint capabilities of the SSIS. •ETL & SQL Error & transactional handling will be used for starting the process from point of failure. oPackage Level load balancing can be performed by using SSIS -Balanced Data Distributor/ performing parallel processing in the package. 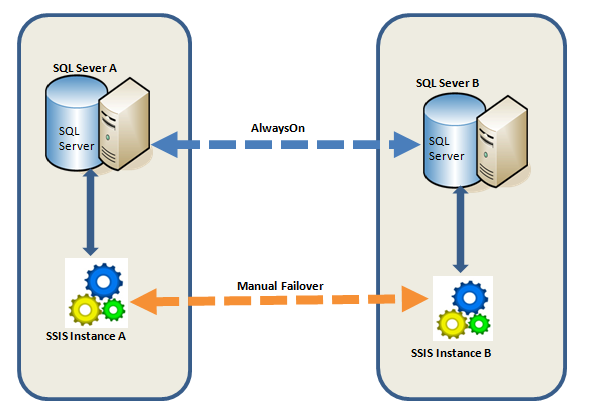 oSSIS Instance level load balancing is not recommended because SSIS supports manual failover only for which if a server is down another server should be available for complete data processing.